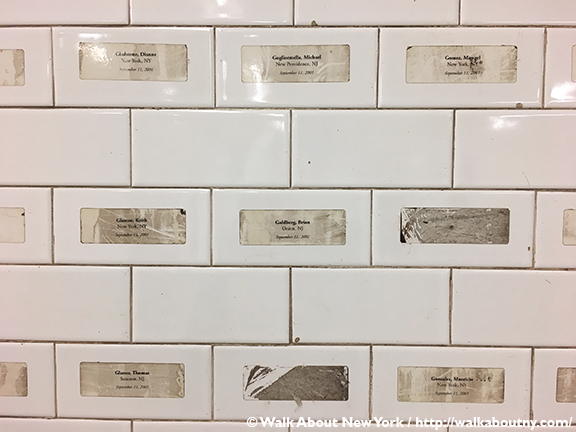 The official 9/11 Memorial at the World Trade Center is a fitting tribute to the lives lost on a date that will be remembered sadly by those who lived through New York City’s darkest moments. There are memorials to those people across the country and around the world. 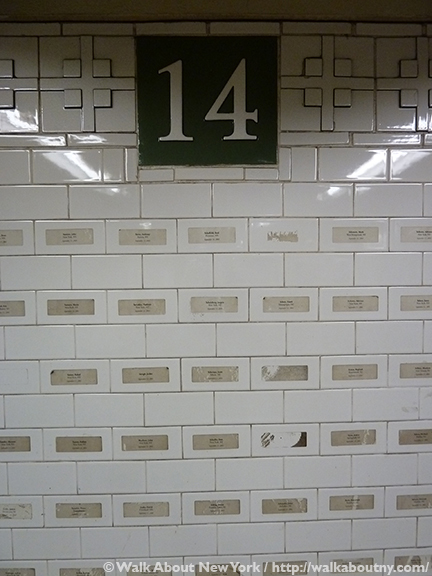 There is even one in a New York City subway station. 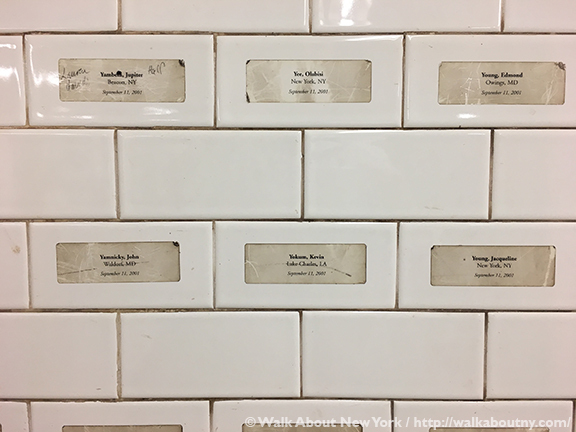 On a series of tiles in a subway corridor at the Union Square/14th Street station simple office mailing labels have been placed. 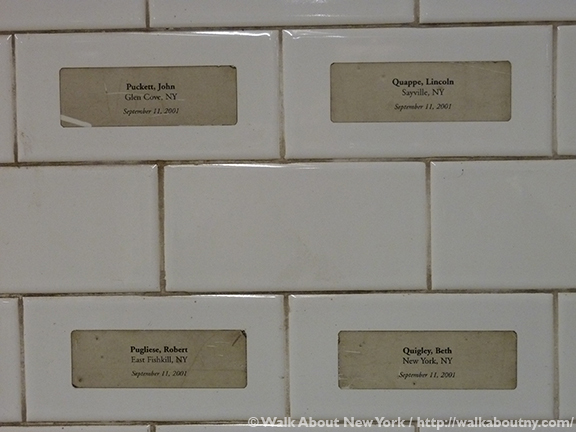 Each label is printed with a name, a city and state, and a date, September 11, 2001. 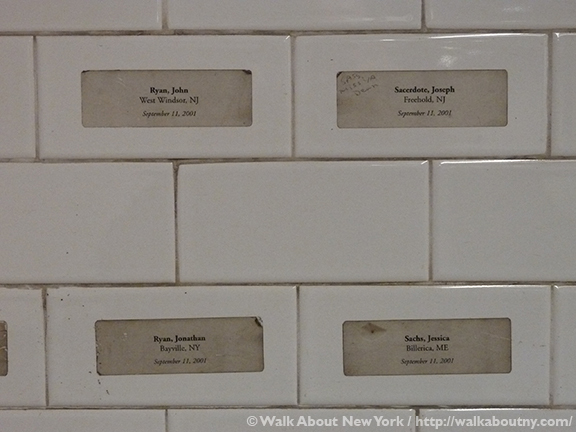 There is a label for each person killed on that fateful day. Created by John Lin, the memorial is little noticed by passers-by. This is a quiet memorial. It avoids grandiose patriotism; but because of the names it does not forget the suffering and trauma Americans experienced. This memorial remembers. 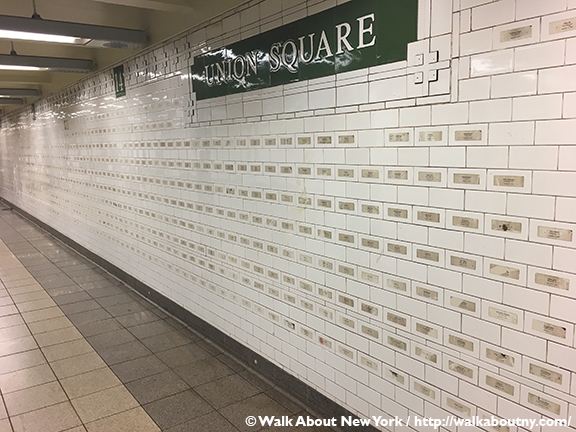 Just past the station’s police precinct along the corridor, connecting the R/Q/W/N trains to the 4/5/6 trains, this understated wall of remembrance to the thousands of casualties of the September 11 attacks on the Twin Towers stands in unassuming silence. Through the efforts of the Manhattan-based, nonprofit organization ArtAid, this memorial has been reminding passers-by since March 2002 that the lives of nearly 3,000 people were tragically cut short on a beautiful, late-summer day with the bluest of blue skies. This memorial can be thought of as a metaphor of life. As with life it is temporary, with a beginning and an end. Time has not been kind to it. 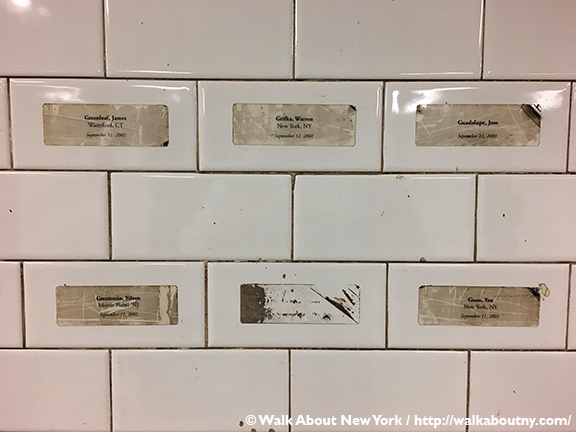 Some labels are missing; perhaps they have been purposely removed or fallen away or somehow disappeared; others have faded or are blackened; still others have been annotated with a cross or another way. This location is appropriate for this memorial. Immediately following the attacks on and the collapse of the Twin Towers City authorities closed down the Manhattan Island south of 14th Street. 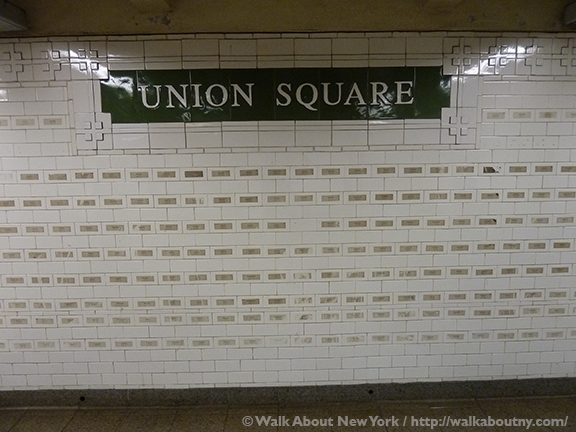 As the largest public space closest to Ground Zero, Union Square become a gathering place for New Yorkers. Over the next several days makeshift memorials of candles, flowers and other expressions of grief were arranged in Union Square. When they were removed this memorial took their place as a way to remember the important role this area played in the City’s grief. Read our past published articles remembering 9|11. 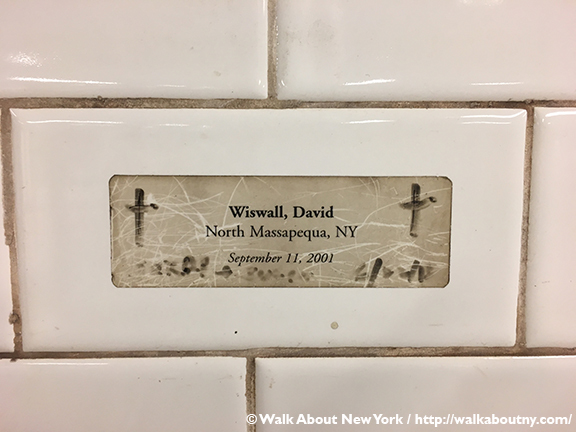 This ephemeral memorial is included as part of our Subway Art Tour One and Subway Art Tour Two, both of which return to the schedule in January 2019. What other surprising sights can be found in beneath the City That Never Sleeps? Take the Tour; Know More!